To add your company logo, company logo URL, and set a main theme color for your console, log in to your console, click your email address toward the top-right, and then click on Account Settings. We recommend adding your company logo URL to your console to personalize items sent to your users. Adding your company logo URL will allow your company logo to populate when the Company Logo Url and Company Logo image placeholders are used in phishing templates, training notifications, and landing pages. Under the Company Information section is the Company Logo Url for Templates field. Here, you can paste the URL of your company logo. This must be a publicly-available URL. We recommend using a small logo here, preferably less than 200px by 200px (our branded landing pages will automatically resize your URL logo to have a height of 80px). Click the Update Account Info button at the bottom of the page to save your settings. We recommend adding your company logo to your console to personalize your KnowBe4 environment. 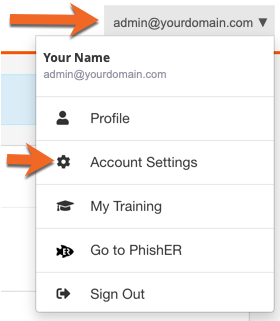 Adding your company logo will provide a “familiar face” to your users upon logging into the security training for the first time. Under the Company Information section, you can import a Company Logo for Console. The company logo you select must be in PNG format, less than 300KB, and resized to 166px x 46px to fit the console. Click Update Account Info button at the bottom of the page to save your settings. If you're a reseller, MSP or multi-account organization, you can also add your logo in the same fashion, management portal. Your logo will output to all of your accounts. Selecting a main theme color improves your end user's learner experience (LX) by providing a familiar feeling when they log in for training. We recommend matching your main theme color to one of the main colors on your company logo to fully brand your end user training console. Under the Learner Experience section, you can Set a main theme color for your console. Click the colored box towards the right to display a color picker, or enter the hex color code that matches your brand color. Learn more about the LX in our Learner Experience Guide.